Kyle Lewis does not have any MLB stats for the season. Draft: 2016, Seattle Mariners, 1st rd. March 19, 2019 RF Kyle Lewis assigned to Seattle Mariners. January 24, 2019 Seattle Mariners invited non-roster OF Kyle Lewis to spring training. July 21, 2018 CF Kyle Lewis assigned to Arkansas Travelers from Modesto Nuts. July 18, 2018 Modesto Nuts activated OF Kyle Lewis from the temporarily inactive list. July 13, 2018 Modesto Nuts placed OF Kyle Lewis on the temporarily inactive list. May 12, 2018 Modesto Nuts activated OF Kyle Lewis from the 7-day disabled list. April 5, 2018 Modesto Nuts placed OF Kyle Lewis on the 7-day disabled list. July 20, 2017 OF Kyle Lewis assigned to Modesto Nuts from AZL Mariners. July 14, 2017 OF Kyle Lewis assigned to AZL Mariners from Modesto Nuts. June 23, 2017 Modesto Nuts sent OF Kyle Lewis on a rehab assignment to AZL Mariners. June 17, 2017 Modesto Nuts placed OF Kyle Lewis on the 7-day disabled list. June 11, 2017 OF Kyle Lewis assigned to Modesto Nuts from Clinton LumberKings. April 6, 2017 OF Kyle Lewis assigned to Clinton LumberKings from Everett AquaSox. October 3, 2016 Everett AquaSox activated OF Kyle Lewis from the 60-day disabled list. August 12, 2016 Everett AquaSox placed OF Kyle Lewis on the 60-day disabled list. Right ACL injury. 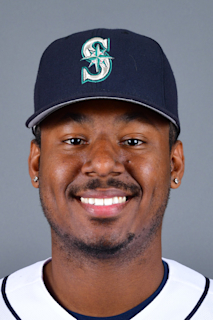 June 15, 2016 OF Kyle Lewis assigned to Everett AquaSox. June 14, 2016 Seattle Mariners signed OF Kyle Lewis.